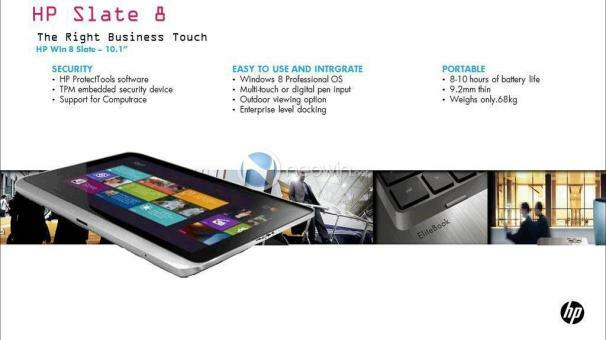 If you're hoping for a slim Windows 8 tablet that can run existing desktop software, HP might have you covered with the "Slate 8." Neowin has posted an alleged product rendering of the rumored HP tablet, along with some details about the device. The Slate 8 will reportedly be an x86-based machine with a 10.1-inch display, eight to 10 hours of battery life, and a frame that measures 0.36 inches thick--slightly thinner than Apple's new iPad. According to Neowin, which cites unnamed sources "familiar with the company's plans," the Slate 8 will run Windows 8 Professional--not the tablet-optimized Windows RT. This means the Slate 8 will be able to install and run desktop software in addition to Metro-style Windows 8 apps. HP is reportedly positioning the Slate 8 as a business tablet, though its slim design and long battery life might catch the eye of regular consumers as well. HP told ZDNet that the company doesn't comment on "rumors or speculation," but Mary Jo Foley investigated with her source and believes the mockup is real. Foley notes the claim of eight to 10 hours of battery life lines up with Intel's promises for its Clover Trail Atom processor, which is due out later this year. In any case, HP's plans to launch Windows 8 tablets this year are no secret, though details are scarce on Windows 8 hardware in general. Lenovo has revealed an actual design in the IdeaPad Yoga, and Intel has also shown off a reference design for an Ultrabook-tablet hybrid, but that's about it. Expect more murmurs about Windows 8 tablets to crop up in the coming months, as several media reports have suggested an October release date for Microsoft's next operating system.